It starts with flashing lights in the rear-view mirror and ends with a ticket or maybe, if you’re lucky, just a warning. Those are the typical outcomes when you’re pulled over by police. 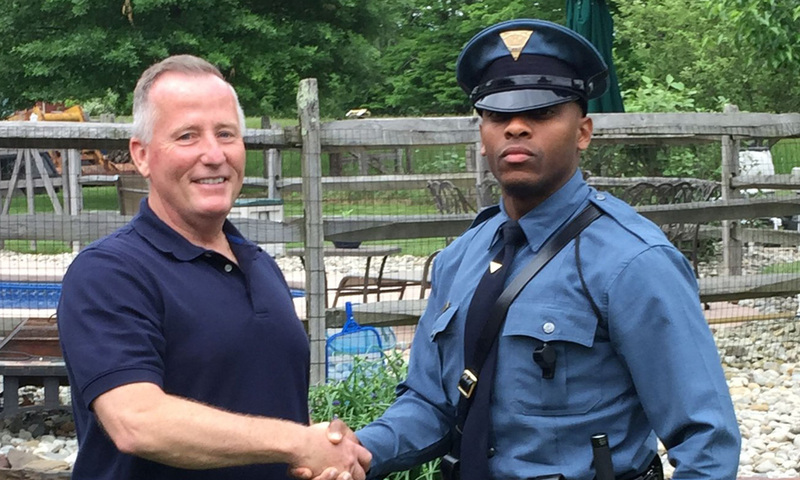 And then there is what happened to a former New Jersey police officer Friday, who found out he was pulled over by a man he helped deliver while on duty 27 years ago. “We’re not sure what the odds are of this happening — maybe they’re close to the odds of a hole-in-one, winning the lottery, or being struck by lightning — but it happened,” New Jersey State Police posted on their Facebook page Wednesday. Twenty-seven years ago, Matthew Bailly was four years on the job as a Piscataway, N.J., police officer when he was called to a home on Poe Place. Karen Patterson had gone into labor while shopping, according to the New Jersey State Police Facebook post, and rushed home to her husband, Bobby Patterson.